This PARTS LIST contains a comprehensive listing of serviceable items to include parts, tools, and supplies for military and civilian Jeep vehicles manufactured from 1941 thru 1969. We also stock parts for the M422 "MIGHTY MITE", the M151 "MUTT" and the M715 "FIVE QUARTER" as well as the 1/4 ton military trailers. We are adding hundreds of NOS parts for the J-Series vehicles and the Jeepster Commando. This PARTS LIST has been arranged to the best of our ability and experience for your convenience in locating repair and replacement parts for your Jeep vehicle. The part numbers, descriptions, applications, images and illustrations used herein are for reference purposes only. No implication is made, unless otherwise noted, that these items are the products of the original equipment manufacturers. Our PRODUCT SEARCH feature is shown at the top of every page on this website. You can easily find a part by entering a part number or part name in the PRODUCT SEARCH box. Let's say you need a new distributor cap for your 1942 Willys MB military Jeep. Simply enter the words "DISTRIBUTOR CAP" in the PRODUCT SEARCH box and click Search. This feature will take you directly to Subgroup 15-04B DISTRIBUTOR CAPS. Maybe you already know the part number for the distributor cap that you need. In that case simply enter the part number "A-5295" in the PRODUCT SEARCH box and click Search. This feature will again take you directly to Subgroup 15-04B DISTRIBUTOR CAPS. Many parts have multiple part numbers for the same part depending on the vehicle model and production year. Many entries in our parts list have an early part number and a late part number. Our PARTS INDEXES is a feature that uses a step by step system to locate the part that you need. Let's say you are still looking for a distributor cap for your 1942 Willys MB military Jeep. You know that the distributor cap is part of a distributor and a distributor is a part of the electrical system. To the right of your screen is our SUBJECT/GROUP INDEX. When the part that you seek is known to belong to a particular subject or group, simply click on the black flag that follows the subject and group. Group 15 covers the the entire ELECTRICAL SYSTEM. Once you are in a GROUP, Subgroups again divide the GROUP by an index. Each Subgroup carries a Subgroup number and a black flag. In this case, click on the black flag that follows DISTRIBUTOR Subgroup 15-04. Subgroup 15-04 covers the DISTRIBUTOR. Once you are in a Subgroup it may be divided again by another Subgroup index. In this case, click on the black flag that follows DISTRIBUTOR CAPS Subgroup 15-04B. Subgroup 15-04B covers all of our DISTRIBUTOR CAPS. Once you are in a Subgroup with a part listing and parts images you can now begin locating the part that you seek by the part number, description, application, and image shown of the part. DISTRIBUTOR CAP, 2 1/8" I.D. WITH 1/2" CAP LOCATOR TAB, FOR AUTO-LITE/PRESTOLITE IGW DISTRIBUTOR. DISTRIBUTOR CAP, 3 1/2" I.D. WITH 1" CAP LOCATOR TAB, FOR AUTO-LITE/PRESTOLITE IAD DISTRIBUTOR. Parts Listing 15-04B DISTRIBUTOR CAPS shows you two choices: A-5295 and A-9307 as distributor caps with an application for the Willys MB Jeep. You can now immediately identify the distributor cap that you need by comparing the distributor cap in your hand with the image on your screen. The DESCRIPTION box will give you additional technical data to ensure that you are going to order the correct part. Don't forget that the distributor installed on your Jeep may not be the original since every distributor used on the four cylinder engines is interchangeable and the engine in your Jeep may have come from another type of vehicle. Every part that we sell has detailed information about that part located in a bar with five boxes that will assist you in correctly identifying the part that you need. Additionally we have a digital image of almost every part that we sell. The first box in each part listing has a PREFIX shown that uses various letters and colors that identify the condition, source and/or manufacturer of that particular part. Unless otherwise indicated the prefix listings are for reference purposes only. Part numbers prefixed with the letters OEM are Original Equipment Manufacturer products. The majority of the parts we sell are OEM. Although may of these parts are no longer available over the counter from your local auto parts store, they are still out there. We go to great lengths to locate and stock as many OEM parts as possible. These newly manufactured parts are from the original USA manufacturers such as Federal-Mogul, Monroe, Spicer, Bendix, Wagner, National, and many others. Part numbers prefixed with the letters NOS are known as New Old Stock parts. These are new, serviceable parts that may be more than seventy years old but are still in the original packaging from Willys-Overland Motors and the US military. We always stock large numbers of NOS parts that we acquire from Jeep dealerships, surplus sales and other sources that have discontinued the Willys Jeep line of parts. We continue to search around the globe for new sources of NOS parts. Part numbers prefixed with the letters T/O are used, "Take-Off" parts that have been removed from Jeep vehicles and components here in our shop. The condition of these parts are exactly as indicated: "take-off". They have not been refurbished or restored. They will more then likely be oily, greasy, covered in old paint and surface rust. It will be your job to degrease, sand blast, prime and paint to bring them back to their original equipment specifications. Remember though, T/O parts are original parts that may not be available new anywhere in the world. The refurbished, take-off parts depicted throughout our website are for identification purposes only. The take-off parts you recieve from us will not look like the images on our website. Part numbers prefixed with the letters R/B are Rebuilt or Refurbished parts that are generally components or assemblies such as engines, starters, generators, frames, and steering gearboxes that we or our subcontractors have rebuilt to serviceable condition. 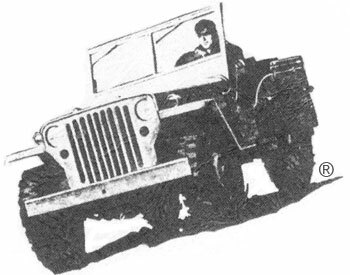 These rebuilt items have been repaired or rebuilt to standards in accordance with the Willys-Overland Motors Service and Repair Manuals as well as the US Army Technical Manuals. Most of our rebuilt parts require a core in exhange. A core charge will be added to the purchase price of these parts. This core charge will be refunded when we recieve a rebuildable component of the same type. Parts that require a core charge are indicated with a red asterisk * in the price box. Part numbers prefixed with the letters RPL are exactly as indicated, "REPLACEMENT" parts. They are also known as "REPRODUCTION", "RE-POP" or "AFTERMARKET" parts. In the worst case scenario many of these parts should actually be called "REPLICA" parts. These parts are of the poorest quality, cheaply made and are more than likely totally worthless copies of original parts. Many of these parts have been on the market for years, are still in production and sadly to say some of our suppliers still offer them knowing full well that they are just plain junk. The vast majority of these parts are of Chinese origin. Others come from India, Turkey, Mexico etc. Some replacement parts that we offer are of American origin. The US flag shown in the description indicates a USA product. Don't assume that all replacement parts are junk, even though a lot of them are. Most of these parts are US DOT approved in order for them to be legally imported into the USA, but just like other imported products, you get what you pay for. If it's cheap then it probably is in more ways than one. We wouldn't be in business if we only sold high quality OEM parts. This is why we give you the option to decide if you want quality OEM parts or a less expensive replacement part. Part numbers prefixed with the letters DMC are replacement products liscensed by the DAIMLERCHRYSLER CORPORATION. These items that are part of a program established by the DAIMLERCHRYSLER CORPORATION that meet their standads for replacement parts. 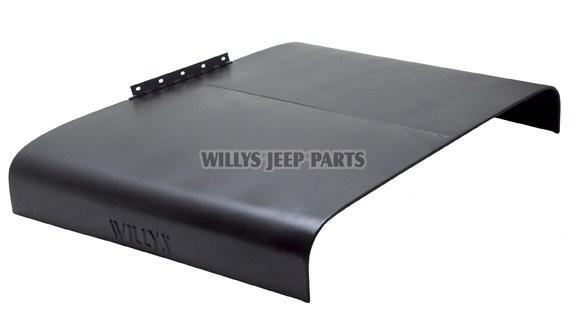 These are parts that carry the Willys or Jeep logo on items such as hoods, tailgates, windshields, cowls, etc. The second box in each part listing has one or more part numbers shown. These part numbers may be additionally prefixed with letters that again identify the part with a source and/or manufacturer of that particular part. This may be an "-R" meaning Replacement part, the letters "NOS" meaning a New Old Stock part or a "-K" meaning a kit. The Willys-Overland Motor Company assigned their own part number to every part that they used whether they made it or not. The original manufacturer part numbers were almost never used. Many parts have multiple part numbers for the same part depending on the vehicle model and the production year. We do use current manufacturer's part numbers for items that were not available or developed when these vehicles were in production. The third box in each part listing has a brief technical description of the part, especially with groups of similar parts. An American flag in the lower right corner of this box indicates that the part is either an original American made product or currently supplied by an American OEM company. The fifth box in each part listing is our current price for that part in US Dollars. The price as indicated in this box is the price per unit, that is, the price of one piece. If the description indicates " 6 reqd. ", that means you need six units at the price as indicated in the price box. Prices change daily if not more often. Refresh your browser on a regular basis in order to keep up with the current price changes. All digital images shown on our website are of the actual part listed. Most of these images are shot in a single group photo session and arranged to show the obvious differences between similar parts. To put it in simple terms "what you see is what you get". Just click here ORDERING & SHIPPING or go to the top of any page on our website and click on ORDER FORM. Abbreviations are used in this parts list and throughout the website. The meaning of many of the abbreviations is obvious but we will offer this list to avoid any confusion. Copyright 2005-2017 WILLYS JEEP PARTS LLC. All rights reserved.